The detailed of Design Calculations Services to quantify the performance of each element of a given system. Designit4u provides companies of all sizes access to cost effective engineering analysis and modelling expertise for mechanical design. We provide all types of mechanical engineering calculations and modelling for design, qualification and acceptance purposes. 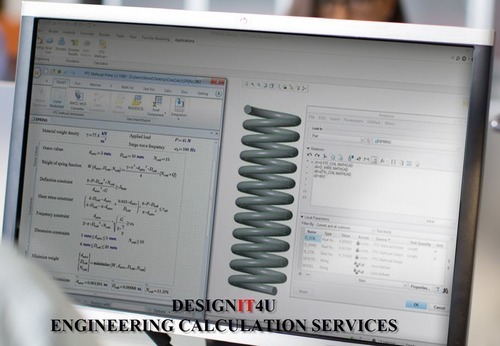 Designit4u is offering Engineering Design Calculations Services to assess the performance and conduct design sizing of a mechanical structure,parts,components. Designit4u provides the full spectrum of structural design and stress analysis from conventional hand calculations, through to advanced non-linear. Our hand calculations are generally carried out in math cad/ mathematica / mathlab and can be provided in either electronic or wet-signed paper form. Looking for “Design Calculations Services”?